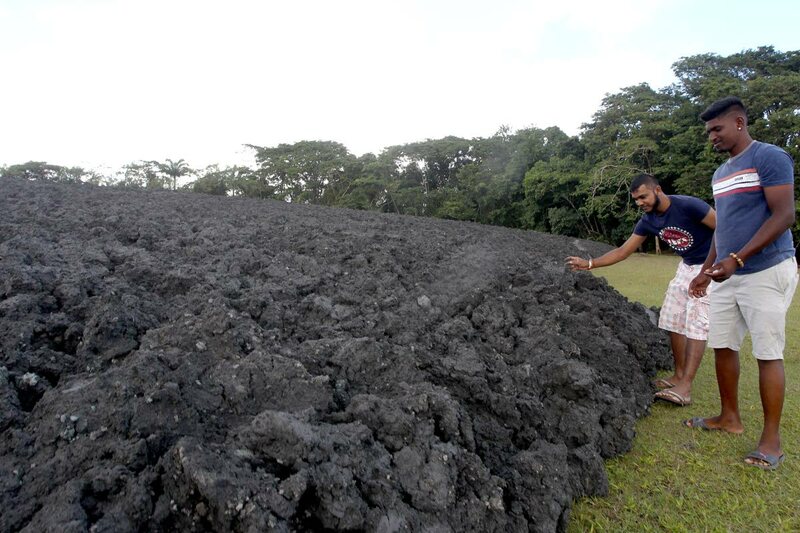 ALTHOUGH residents have been allowed to stay in the area near the Devil’s Woodyard mud volcano, Princes Town Regional Corporation chairman Gowrie Roopnarine has advised the general public to stay away from the area for at least two weeks, as the mud was still in a semi-liquid state. The volcano erupted twice on Tuesday morning, spewing mud and gas some six metres into the air, while the disc of mud expanded to cover an area approximately 100 metres in diameter from the centre of the eruption. Roopnarine said personnel from the University of the West Indies and the Environmental Management Authority had advised that while villagers were “free to stay at the site,” the mud was still soft. “They are advising the public to stay away for at least two weeks until that area is dried back up before we allow the public to access the site,” Roopnarine said. “They (the residents) are safe at this time, because the gas that is coming out is very minimal and will not affect anyone.” Geologist Curtis Archie said based on historical data, the mud volcano had probably re-entered a dormant stage and may not erupt again for another 29 years. “From all the other eruptions, once you have the activity, nothing happens again for another while, so if you remember Piparo (mud volcano), it erupted and then nothing happened and nothing has happened really since then,” Archie said. The Piparo volcano erupted on February 22, 1997, two years after the 1995 Devil’s Woodyard eruption. Archie said a French researcher had collected data which seemed to suggest the Devil’s Woodyard erupts on an average of every 29 years. “The last time was in 1995 to now, that is 23 years, which is a little shorter than average. Piparo has a similar 20-something year cycle. “Nearly all of these volcanoes kind of erupt in a cycle.” He said given the history of these events, the volcano is probably dormant again. It was not known for sure whether gas is being built back up, but in other cases, once a mud volcano erupts, it stays quiet for between 25 and 30 years. He also cited the volcanic island which appeared in the Columbus Channel in 2001 as further evidence of the cyclical nature of the mud volcanoes. “The last time before that was in the 1970s, I believe, and that is roughly a 30-year cycle, so there is a cyclicity to this thing,” he said. “If you imagine a big bubble of mud and gas and water coming from the ground, once it makes it up, all the gas dissipates and then that is it. He said Tobago and the northern part of Trinidad did not have mud volcanoes, as they were often associated with hydrocarbon deposits. Reply to "Mud volcano goes quiet"